While there are many exciting things about the college application process, paying for your post-secondary education is not one of them. If you’re planning for college now, you may be wondering where to look for financial aid, or if it even exists. Well, you’re in luck. Financial aid is out there, and there may be resources available for Iowa residents than you think. Different types of aid have different eligibility standards, so you won’t need to be a high school genius or demonstrate substantial financial aid to qualify for all of them, either. The state of Iowa, as well as other public and private organizations, offer several scholarships and grants for Iowa residents can use towards their college education. What types of financial aid are you eligible for? And where do you need to look to find it? Let’s walk through the four steps every Iowa resident should take towards funding their college education. Your first step to finding financial aid is filling out the FAFSA, which stands for Free Application for Federal Student Aid. Many people think that the FAFSA is not a fun form to fill out (which is why we’ve created a helpful guide for you to refer to throughout the process). All college prospects who are seeking award money will have to fill it out, however, as it is the nation’s standard form to determine federal financial aid eligibility. You will want to submit the FAFSA as soon as possible, so that you don’t miss out on any scholarships and grants with application deadlines. Also, keep in mind that some awards work on a first come, first serve basis, so applying early is always in your best interest. The FAFSA will determine your eligibility for some government-funded aid, but some Iowa grants and scholarships require separate applications, as well. The Iowa Financial Aid Application is specific to the state of Iowa, and is a requirement for certain award applications. The good news is that this form is painless compared to the FAFSA. You’ll need to provide some brief information about yourself, such as birth date, GPA, and high school, and then you’ll be evaluated for different types of Iowa financial aid. When applying for financial aid, it’s important to read the award descriptions carefully. Pay close attention to what forms you should submit with your application, and the deadline that you must submit them by. Gear Up Iowa Scholarship for students who are part of the GEAR UP Iowa Cohort. The Scholarship provides up to $2,600 a year and can be used at institutions within Iowa or out of state. All Iowa Opportunity Scholarship for all Iowa residents and Iowa high school graduates who are enrolled as a first-time freshman at eligible institutions for the upcoming school year who demonstrate extreme financial need. Applicants are required to submit a FAFSA and an Iowa Financial Aid Application. Robert D. Blue Scholarship for students attending or planning to attend an Iowa college or university, who demonstrate literacy and scholastic ability, exhibit qualities of truth, courage and fellowship, and display moral character. Applicants are required to submit two reference letters and a 500-word essay. Governor Terry E. Branstad Iowa State Fair Scholarship for Iowa high school seniors graduating with the class of 2018 who actively participate in the Iowa State Fair and plan to enroll in an Iowa college or university. Iowa Tuition Grant for students enrolled at an eligible Iowa private college or university. Kibbie Grant (Iowa Skilled Workforce Shortage Tuition Grant) for Iowa students enrolled in at least three hours of a specified career or technical education program at Iowa community colleges. The grant pays for half of the cost of an average Iowa community college education for up to two years. Iowa National Guard Education Assistance Grant for members of the Army or Air National Guard pursuing a certificate or undergraduate degree at an eligible Iowa college or university. Members must apply through the Iowa Financial Aid Application. Iowa Vocational Technical Grant for Iowa residents enrolled in at least three credit hours at an eligible program of study at an Iowa community college. Click here to view the full listing of Iowa’s scholarships and grants. Not all award money is administered by the state and federal government. Some aid may be administered by your local governing bodies, and private organizations often release scholarship applications or competitions, too. For high school students, your high school guidance counselor will be able to keep you updated on scholarship opportunities in your community, so make sure to set up regular advising appointments. The calendar app in your phone can help you keep track of appointments so you don’t forget what you signed up for. Try doing some research on your own as well. You never know what a couple of Google searches could pull up, and websites such as CollegeScholarships.com can help you find award money specific to your state of residency, personal interests, and needs. You can also visit the websites of individual organizations. The Iowa Games is one private organization that offers the Brian Pearson Memorial Scholarship each year. This is a scholarship specifically for one male and one female Iowan, in honor of former University of Iowa basketball player Brian Pearson, who died of brain cancer in 1997. Last, don’t forget to look up the schools you are applying to. Chances are, they will have scholarships listed specifically for students admitted to the institution on their financial aid webpages. 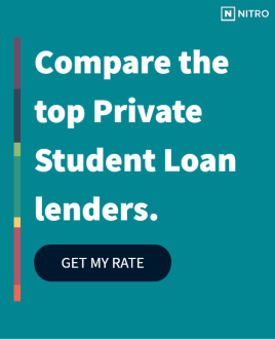 If you’ve applied for grants, scholarships, and federal loans, but still need additional college money, a private loan may be just what you need. Not all loans are equal, however, so don’t accept the first offer you find. First, check out our NitroScore tool to get a good estimate for the size of loan you will need, and which of our highly vetted loan partners can offer you the best rate. Don’t worry, the tool is free of charge and simple to use. Type in a college and major into the indicated boxes, and the tool will calculate your total tuition costs, your salary after graduation, and your potential loans needed. From there, it will give you a score that tells you how easy those loans will be to repay based on your projected salary. Mess around with different college/major combinations to find a good fit, and then customize the results with info about scholarships, grants and savings that apply to you. Iowa residents shouldn’t have to pay for college alone. Start your financial aid journey today!